You know the deal, we have talked about this before. These are all things that we try to do at The Neon Leopard. So when a friend and I found our plans cancelled on a recent Friday evening, we decided to seek out an adventure and find something cool and unique to do in our city. We got to Googling and somehow landed on the page for the Toronto School of Circus Arts. I had heard about some of their classes before but didn’t realize that they had a drop in class. For trapeze. On Friday nights. Perfection connection, we now had a plan. The Toronto School of Circus Arts is an incredible facility that we had not visited before, so we were excited to check it out. The Toronto School of Circus Arts is an exciting alternative for active lifestyles, with circus arts instruction for all ages, interests and abilities. Programs offer expert coaching in a state-of-the-art facility. The school embraces creativity, athleticism and passion in a structured, progressive system where your safety and enjoyment is the number one priority. Learn to do amazing physical feats in a fun, supportive environment. 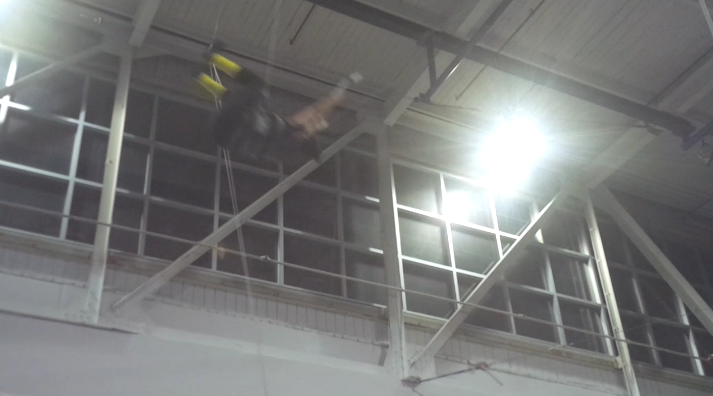 Soar through the air on the flying trapeze. Walk on your hands. Defy gravity with exciting acrobatic moves. You’ll be amazed at what your body can do. The Toronto School of Circus Arts is about challenging yourself, about doing something daring and thrilling and completely different that will excite your senses – and reward your soul. Toronto School of Circus Arts is located in a 15,000 sq. ft. training center housed in a renovated airplane hangar in Downsview Park, and features the most up-to-date circus arts equipment available. Everything used is regularly inspected for maximum safety and peace of mind. Whether you’re a gymnast or dancer searching for a new challenge, a parent looking for a great kids’ activity, or you’re just bored with working out at the gym, they say that they offer great classes that will take your fitness to the next level – and keep you strong, flexible and in better shape than ever. When we arrived at the facility at Downsview Park, we were surprised to see how huge a complex it is. There is free parking and the building can be a bit confusing to navigate as it also contains indoor soccer, hockey and beach volleyball. 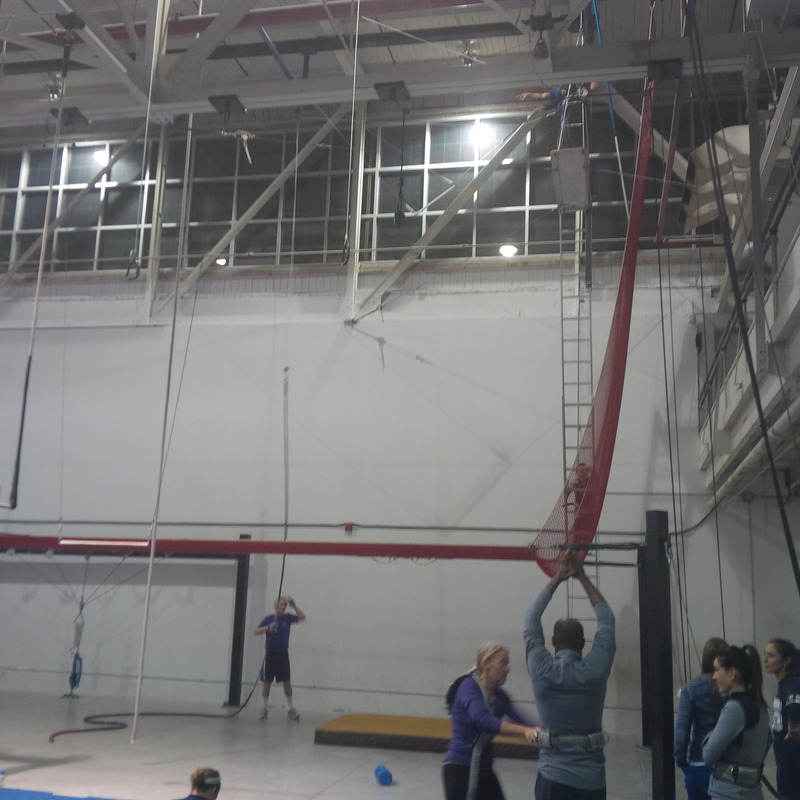 The drop in flying trapeze class is designed to help participants build skills without committing to a whole session. It is designed for all levels, and the classes are held at 7pm on Friday nights, all year round. The class usually lasts anywhere from 1-2 hours, and is based on the number of participants who stop in each Friday. Its $25 and for thrill seekers ages 8 and up. We arrived for class, signed a registration and waiver, paid and stepped into the facility to have a look at what we had gotten ourselves in to. Ok- so let’s be clear. We thought this would be a fun class where we swing around a bit and learn some techniques from maybe a few feet off the ground. NO. The trapeze is HIGH. Very HIGH up. Now I am not usually afraid of heights, but I have to admit that I was very quickly terrified when I saw what we were going to be doing. The instructor did a quick demo of our first “trick” before queuing us up to try ourselves. There were about 40 students in the class and the school put our names up on a monitor with numbers so that we knew the order of events. I am near the end of the list, so I got to watch several people go first and shake in my booties (erm…leg warmers) for a while. For our first trick, we were supposed to climb up a 28 foot ladder and stand on a platform where a professional instructor was waiting. The instructor would harnessed us into the safety mechanism. At that point, we would be are instructed to grab the trapeze bar and then swing out to execute a mid-air maneuver, hanging from the bar with our legs. An instructor below would yell commands and let us know when to release the bar and land in the safety net. Sounded easy enough. Fast forward to my turn. To say that I was scared would be an understatement. I was legitimately terrified. But, that made me even more motivated to slay my fear and do it. The Circus Arts staff were incredible and they were so kind and reassuring when they saw that I was scared. The climb up the ladder was one of the scariest parts of the whole experience for me. That narrow little ladder shook with every step up I took. Even though I knew I was harnessed in, it still felt like I could go plunging to the ground at any time. Key advice- don’t look down during your climb. When I got to the top, the instructor waiting had to deal with a twist in the rope that needed to be straightened. So, I had to wait on the narrow platform. SCARY. When the rope had been fixed, it was time. Too late to turn back. 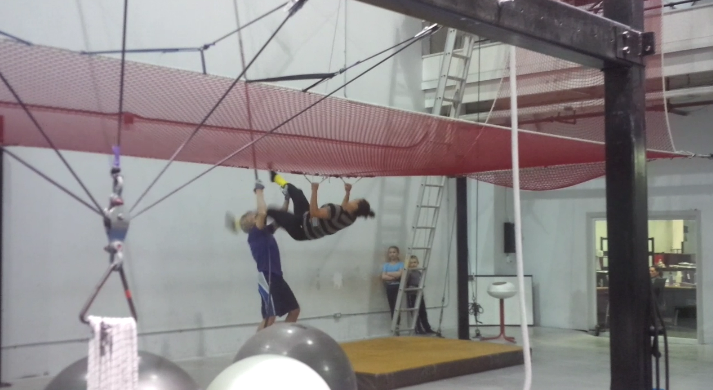 You have to trust in the instructor standing behind you to hold you up while you reach out and grab the trapeze bar. Another scary moment. Then, on his command you hang on for dear life and step off of the platform. So, I did it. I stepped off of the platform and swung. The other participants and staff are so super supportive, they really cheer you on if you’re scared and it definitely helps. But when the instructor below yelled for me to kick up my legs and let go to try the trick, I yelled down, “Nope. I’m good. “I was ready for my feet to touch solid ground. He gave me the cue to let go and I floated down into the safety net. I may have been in too much of a hurry to hit the ground, as I accidently gave the ground instructor a swift kick in the face attempting to get off the net. Oopsie. 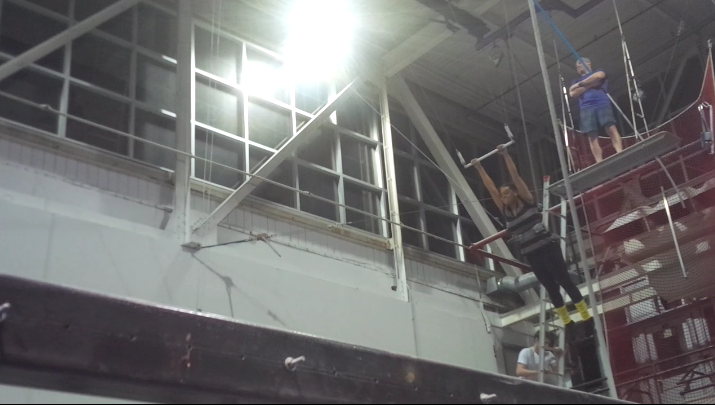 I felt really great that I actually got up and tried the trapeze! At this point the class was showed how to do a somersault dismount and we queued up again to try. Again, “Nope, I’m good.” I was satisfied with getting up there once and I really did have a burning desire to go again. So we decided to peace out on the rest of the class and go for AYCE sushi instead. Don’t judge. Moral of the story, it feels so good to look your fears in the eye, crush goals, and check items off of your bucket list. I won’t be running away with the circus any time soon, but I swung from a freakin’ trapeze and that’s good enough for me! 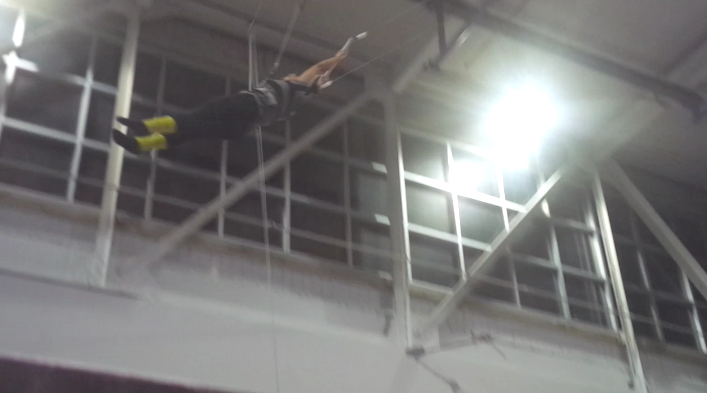 I highly recommend checking out the Toronto School of Circus Arts for a drop in flying trapeze class. Staff are extremely helpful and skilled and the class is very organized and hands-on. 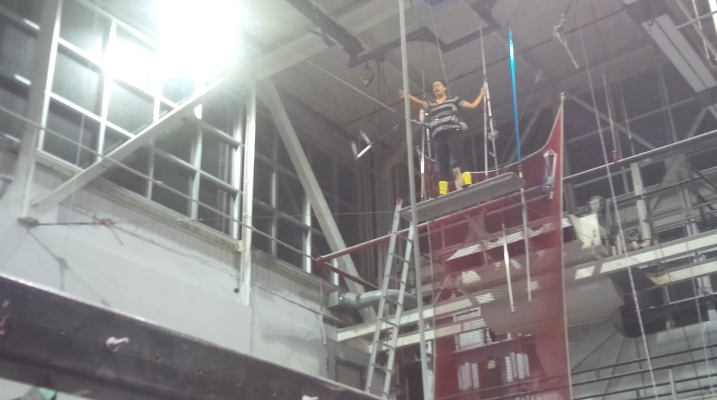 Also, chances are, you won’t wimp out like I did and get a good amount of trapeze time. If you do decide to hone your circus skills and pay them a visit, I would love to hear about it below. Toronto School of Circus Arts is located at 75 Carl Hall Road (416) 935-0037. I am in awe – you are fearless! 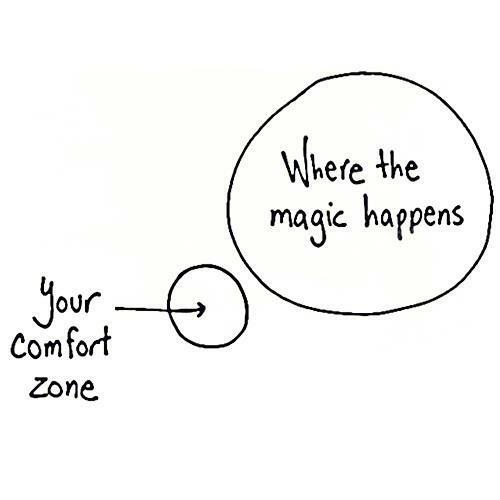 I am so inspiried by the daring things you do, and how far you venture outside your comfort zone. Maybe I will work up to the courage to try it out one of these days – bucket list item!